On the guitar, Dorian mode is the second mode of the major scale. It’s the sound that’s created when the 2nd scale degree is functioning as the tonic. Because it features a f3rd and centers on a minor chord, it’s considered a minor mode. 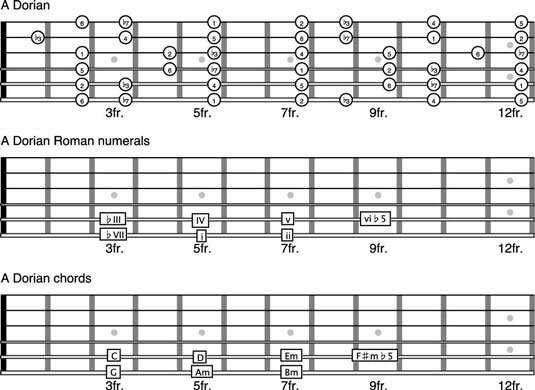 Looking at this scale’s construction, Dorian mode can be thought of as a natural minor scale with a major 6th. This major 6th makes the fourth chord in Dorian mode major, allowing for a i-IV chord progression in a minor key, which you play in a moment. In music, you use the major scale as your starting place for naming chords, scale degrees, and intervals. From this perspective, the pattern of whole steps and half steps between the scale degrees of the major scale, or Ionian mode, are what are thought of as the naturally occurring ones. If the distance between any two scale degrees is changed for some reason, you can reflect this change with an accidental, typically a sharp or a flat. You use accidentals this way when you’re representing the scale degrees of different modes. Here is how to view the fretboard in A Dorian mode. Notice that these notes and chords are the very same ones you use for G major. The only difference is that the 2nd degree, A, is now the tonic and counted as number 1. If you want to play a Dorian scale, play 1 to 1. This is just one example of how you can view the fretboard in A Dorian mode. You can play the notes as five separate patterns or make your way through the notes in some other fashion. You can play the chords as shown here, or play the chords elsewhere. Whatever you do, it’ll always be A Dorian mode as long as you’re using notes and chords from the G major scale and the 2nd degree, A, is functioning as the tonic. You can play in other Dorian keys by centering music on the 2nd degree of other major scales. In order to properly produce the Dorian sound, you need to hear the G major scale notes played against a chord progression that centers on the 2nd degree, A. Here you see a sample chord progression that can be used as accompaniment. This is essentially a ii-V chord progression in G major that becomes i-IV when you number from A. You can play along with G major scale to produce the sound of A Dorian mode in A Dorian Play-Along Track. As you play through the G major scale patterns, you should notice something. The tonic pitch isn’t G; it’s A. As a result, you change how you play your phrases. Generally speaking, it sounds best to center your playing around the tonic pitch, A. This doesn’t mean that you must start and end on A — all the other notes in the scale are still fair game — it just means that the scale will sound stable and at rest on A because it’s the tonic pitch. Some say that to play a Dorian scale, you just start on the 2nd degree of the major scale. Although this is true in a sense, it’s really misleading. You don’t create the true modal sound simply by starting a scale on a different degree. You need to mix the scale with accompaniment to produce the true modal harmony. When you mix the major scale with the right modal chord, it doesn’t even matter what note you start on. In other words, playing G major scale patterns over a piece of music centering on Am produces the A Dorian sound, even if you don’t start playing the scale on A. The starting place doesn’t create the mode. The mixture of the scale and the tonic pitch or tonic chord does.